Over the last few weeks, I’ve become increasingly interested in computer vision. After finally getting OpenCV running, playing around with a little face detection and searching for solutions to weird problems that occurred, I decided to dive a bit deeper into computer vision to figure out how it actually works. I started out with blob detection, which simply means detecting, locating and measuring an object in an image. A really simple way of doing something like that (without having to worry about object textures and creepy stuff like that), is to use color to identify blobs. In this article, we’re going to build a clown’s nose detector by finding the biggest red blob in an image. We won’t use any computer vision libraries, the only thing we’ll need is ChunkyPNG by @wvanbergen (but you can use any library that allows you to loop over a image’s pixels). Here’s the image we’ll be working with. If you’re interested, it’s Bassie from the dutch circus duo Bassie & Adriaan. 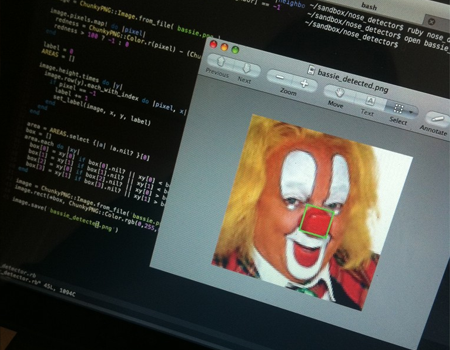 The important thing about this image is that the nose is the biggest red object, since we won’t really be recognizing things as clowns’ noses, we’re just detecting red objects. First, we load in the image and simplify it to make it easier to work with. Since we’re only interested in the red pixels, we can turn the original image into a binary one. We go over each of the original image’s pixels and figure out it’s redness. If the pixel is red enough (we’ll use a threshold of 100/255), we give it a value of -1, meaning the pixel is interesting but we still have to process it. We don’t need to do anything with the other pixels, so we’ll give those a value of 0, these are the background pixels. Now we have an image we can work with, let’s divide the separate blobs so we can measure them individually to figure out which one the nose is. To do this, we’ll loop over every pixel in the image and see if it has a -1 value because it still needs to be processed. If it does, we’ll give it a label and add it to an areas array. As you probably figured out already, we’re assigning each pixel with a -1 value a separate label right now. This means pixels in the same blob get different labels. We don’t want that, since we want to label groups of pixels that belong to the same blob. To do that, we need to check the pixel’s neighbors too. To be able to find connected pixels, we need to know each pixel’s neighborhood. For this example we’ll use a 4-neighborhood, which means we use the pixels right above (north), to the right (east), right below (south) and to the left (west) of the current one. The 8-neighborhood also uses the northeast, southeast, southwest and northwest pixels, but we won’t really need that for something simple like this. As you can see, there were some detected areas that overlap and should have been counted as one. This shouldn’t be a problem for this example, but using an 8-neighborhood can solve some of these issues and make the result more precise, if you end up needing it. Of course, this method isn’t fool proof, but it’s a really simple first step into computer vision. As always, if you used this idea to build something yourself, know of a way to improve the code or have some questions or tips, be sure to let me know. You can find the complete source in this Gist. Have fun!